Hudson Valley Flying Circus | “CIRCUS 6 STEP MEET” ..DEREK DiBONA (16′ 1.75″) … SAMANTHA BEYAR (12′ 4″) FLY GOLD / “DOC” ANDRESEN SOARS 10′ 1″ !!!! “CIRCUS 6 STEP MEET” ..DEREK DiBONA (16′ 1.75″) … SAMANTHA BEYAR (12′ 4″) FLY GOLD / “DOC” ANDRESEN SOARS 10′ 1″ !!!! Congratulations to all 44 athletes and family members attending this weeks “SUPER SIX STEP MEET” here in Warwick Valley. The day was filled with 12 hours of ‘Pole Vault Spirit’ in all divisions and great stories of fiberglass filled the 100 year old dairy barn’s hay loft. 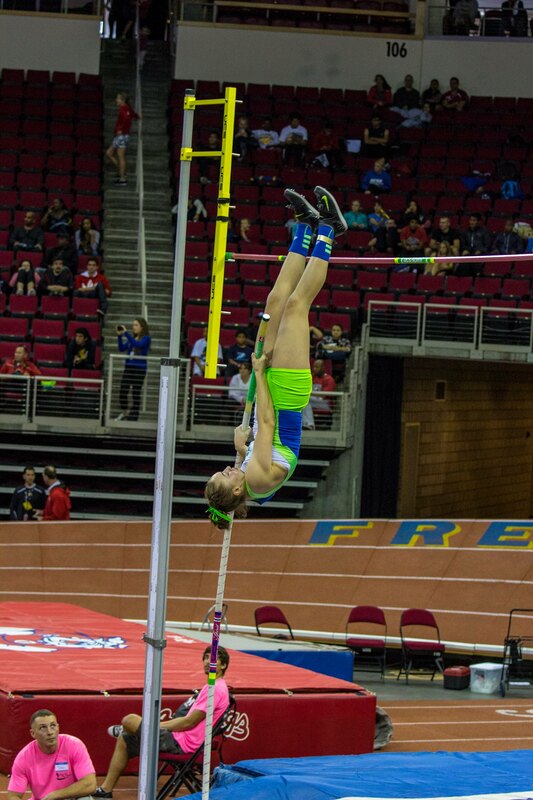 New personal bests…school records and the best of all…three great jumps at a 73 Year Old Masters WORLD RECORD!!!!! Yes… this season will be SPECIAL !!!!! Girls Highlights… Monroe-Woodbury,NY senior Samantha Beyar took home the gold..with a personal best of 12′ 4″ to lead the HS Girls and club team mate Maddie Schneider (Darien,CT) flew 12′ 2″ with a small grip…to lead the 19 Girls Meet. Warwick Valley 7th Grader Genevive Reilly won Middle School at 6′ 7″. Boys Highlights… Warwick Valley,NY senior Derek DiBona also set a personal best at 16′ 1.75″ on his 15’1″ x 190 UCS Spirit Glass Rocket. He now leads the Boys list for THE MILLROSE GAMES HS BOYS Pole Vault Invitations. Top 8-10 Boys will be invited for the February 14 Meet at the New Balance Armory Center.Luis Escarret(Ridgefield Park,NJ) won the Open Meet at 14′ 3″(PR)… the “BIGGEST THRILL” of the meet perhaps went to John “DOC” Andresen of Aquebogue,NY… This 73 Year old Master’s vaulter…coached by legendary vault guru Jim Henderson at The Warehouse in Long Island soared to his 10′ 1″ gold medal and then took 3 great shots at the Age Group WORLD RECORD of 10′ 8″ and had close bars on all three.. Join him at our 7 Step Meet on Nov. 22 and be a part of the WORLD RECORD MANIA !!!! 10′ 8″ Jordan Messinero(Sachem.NY) Top Soph !! 12′ 7″ Nick Marrino(Hatsboro-Horsham,PA) Top Soph ! Special Thanks to all Pit Volunteers for making our meet run smoothly…Ben Simonet..Adam Dillion…Jordan Messinero…Kerstyn Ciulla and all others… we appreciate all your help!!! Girls at 10AM Boys at 3PM Entry $20/Athlete At The Door.